While our office focuses on aesthetic dentistry and uses all tooth colored restorations, some premium restorative options can produce more life-like results. Should a particular, aesthetic option be right for you, Dr. Titus will discuss this with you. If high cosmetic results is of the utmost importance for a discriminating patient, please ask about our premium options that can enhance the result of your restorative procedure. Restorative dentistry, covered under all insurance plans, is different from high-end cosmetic dentistry. For most patients, our normal aesthetic goals are more than satisfactory. However, if you want near perfection and the associated work to achieve this, we consider this addition effort, materials and lab cost a premium service. Patient's electing high-end cosmetic dentistry should make this known before embarking on any restorative work. Our office will quote you for such. This sort of option includes many of the options below and others not listed. It also includes any additional laboratory remakes, shade changes, characterizations and recontouring that is necessary to produce esthetic perfection for your smile. We take great efforts to match your natural shade and provide the same shape of adjacent teeth when any restorative procedure in done. High-end cosmetic dentistry goes beyond this in making custom staining to mimic shade gradations, adding translucency and including minute shapes to surfaces that can only be discerned at very close examination. To provide cost-effective, aesthetic dentistry, reasonable cosmetic results is the goal of our office. Most insurers do not reimburse us at a level where we can take all the measures necessary to do high-end cosmetic dentistry on each patient. We do, however, find that the vast majority of patients are very happy with the efforts make with all our restorative procedures, and the aesthetic results we obtain with our normal restorative efforts. 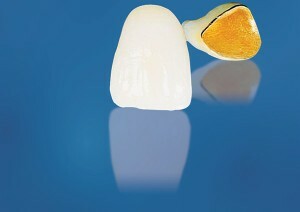 Captek is just one of the many different types of crowns we offer. This premium crown is prized for his high gold content and the patented method by which the metal under layer is fabricated. The warm, yellow gold color provides the perfect foundation for porcelain as it mimics the yellowish inner tooth layer--the dentin. The strength, beauty and bio-compatibility of the Captek is superb. It provides the patient with the perfect balance of all these qualities. You can surely see the difference a quality, esthetic Captek crown makes in your smile! Procera Brand Crowns are a non-metallic substructure crown that boast strength and high esthetics. The patented process for fabricating the substructure of the tooth involves milling a coping with 3D CAD/CAM technology. This coping, an underlayer for the porcelain which makes up the bulk of the crown, is milled larger than needed. Then during a firing process this coping shrinks to exactly the size needed to fit the prepared tooth with precision. This firing and shrinking process makes an incredibly hard, non-metallic base to build the tooth-like porcelain on. One of the crowns on the young central incisors to the right are a Procera crown--can you tell which one? This removable partial denture--or RPD--is a more esthetic alternative to a conventional metal/resin RPD. 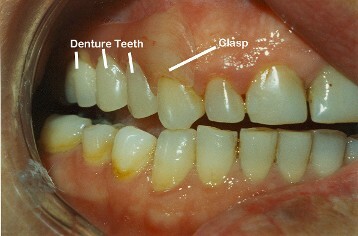 On cases such as that shown, a metal clasp on the first premolar or canine tooth would prove to be unsightly. The Valplast denture is not only more esthetic, but it is constructed out of a proprietary material that makes the denture flexible. This property makes it more comfortable and virtually unbreakable. 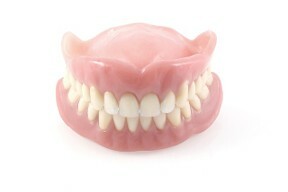 Ask if this type of denture might be for you. This unique material can also be used in combination with a metal frame to make a hybrid denture that has esthetics, stability and support. Our standard denture is a quality, custom fitted denture that will provide patients with long years of service and high esthetics. We do, however, offer our patients both SELECT and MASTERPIECE denture upgrades. Apart from longer warranties--one year and two years respectively--these premium dentures use a more dense Lucitone 199 acrylic and premium denture teeth that offer more wear resistance and a larger variety of shapes, sizes and hues. Considering that dentures will give many years of service--sometimes 20 years or more--an upgraded can help insure that the prosthesis will have a lasting beauty throughout its long lifespan. Ask Dr. Titus about these premium denture upgrades and see whether they maybe right for you. All dentures can be personailzed with your name and phone number at no additional charge.